Formation Zone has announced the winners of the 2016/17 Business Challenge. Each winner takes home prizes from Formation Zone and our sponsors Santander Universities. Formation Zone has announced the winners of the 2016/17 Business Challenge. This year, as well as the overall prize, we had winners in three categories – Creative, Digital and Technology, and Health – with each winner taking home prizes from Formation Zone and our sponsors Santander Universities. 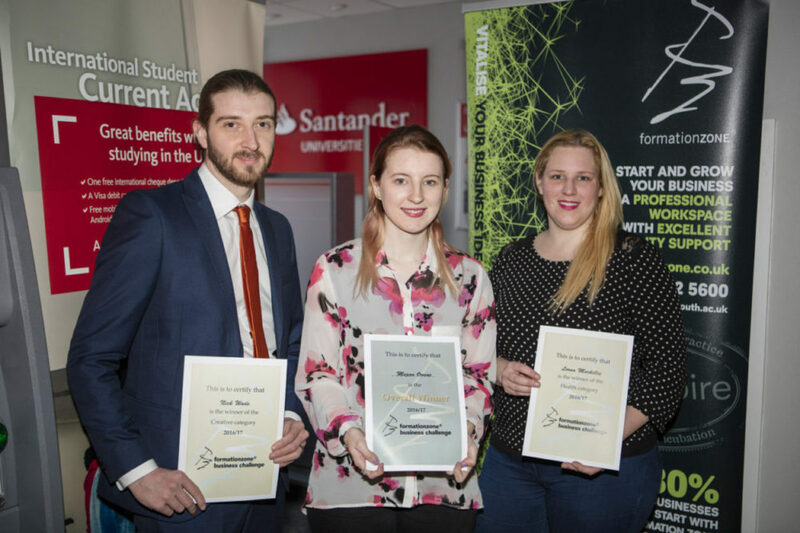 Thanks to Santander Universities, the Challenge’s headline sponsor, each category winner takes home £650 in seed funding for their business, with the overall winner netting an extra £1,000 to help them on the way to success. As well as their cash prizes, Formation Zone is providing the winners with six months in our award-winning incubator. Congratulations to our winners Megan Owens, Lorna Markillie and Nick Wade! Megan, of Geometric Recruitment, won both the Digital &Technology category and the overall prize for the highest scoring plan. Megan’s business, Geometric Recruitment, is an innovative new way for employers and potential employees to navigate the jobs market. Lorna, of L&D Training, won the health category with her business offering a range of services that help employers deal with sensitive issues. Nick, of Nikomus Games, won the creative category with his games development business focussing on mobile virtual reality content. Our winners will now take up their places in Formation Zone, where they will be supported by our team of expert business advisers, and the businesses around them, to turn their business ideas into reality. With access to business coaching and mentoring, as well as University expertise and regular 1:1s with our Programme Manager, these fledgling businesses couldn’t be in a more nurturing environment to help them grow. But, it’s not just the winners that take something from the Formation Zone Business Challenge. All of our contestants have had access to workshops, professional advice from our partners, and will get detailed feedback on their business plans from our expert judges. Our congratulations to all who took part this year; watching your progress has been amazing! The Formation Zone team would also like to thank our sponsors Santander Universities, for their generous support of the competition, and all of our partners, without whom the Challenge would not be able to help so many of our talented students and graduates.